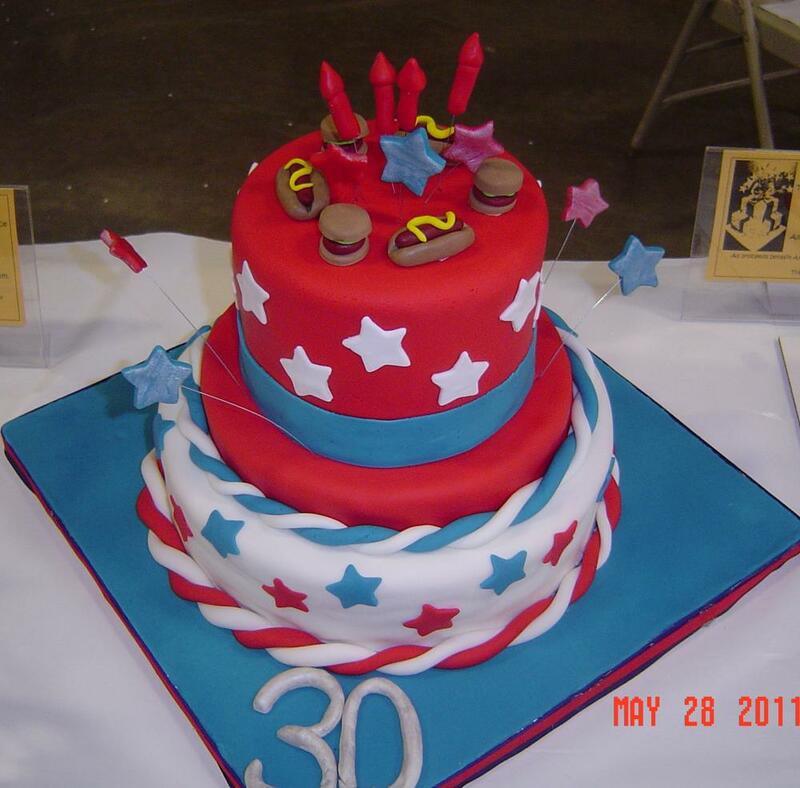 The winning Best-In-Show cake design in Arts Partners First Annual Cake-off Competition celebrated the 30th anniversary of Fulton's Memorial Day Salute and featured edible fireworks, stars, hot dogs and hamburgers. For more information about the group visit www.CNYArtsCenter.com. Fulton’s Arts Partners hosted its first annual Cake-off Competition at the recent Memorial Day Salute. The contest invited cake artists to submit celebration cakes in the patriotic theme of the Memorial Day Salute or as a celebration of the arts to bring awareness to the group’s mission: to open an Arts Center in Fulton for all ages and arts. Kelsy Natoli was named winner of Best-In-Show Cake Design. A native of Fulton and 2008 Graduate of G. Ray Bodley, Natoli is currently a Baking and Pastry Food Service Management Student at Johnson & Wales University in Providence RI. The patriotic red, white and blue 3 tier cake celebrated the 30th anniversary of the Memorial Day Salute and featured edible fireworks and stars with miniature hot dogs and hamburgers. Her winning design received the most donations throughout the day distinguishing it as Best-In-Show for the arts group’s first official fund-raiser. 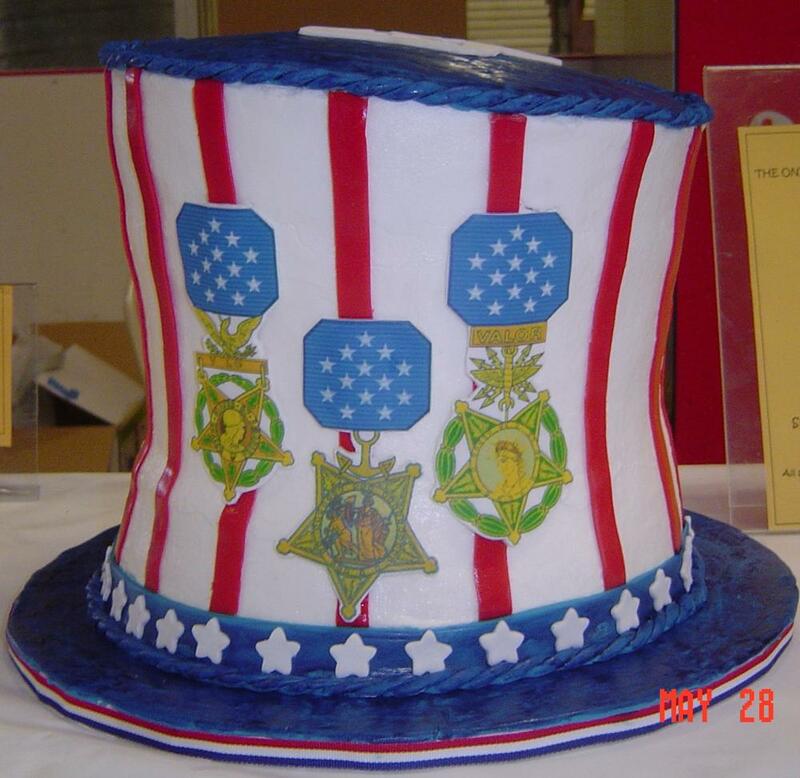 This multi-layered patriotic Top Hat displayed military insignia in recognition of the Memorial Day Salute to Veterans and received the top bid in silent auction during Arts Partners recent Cake-Off Competition in Fulton. For more information about the group visit www.CNYArtsCenter.com. Coming in a close second, Candie Smith’s cake drew the highest bid of all entries in the Cake-Off’s silent auction. 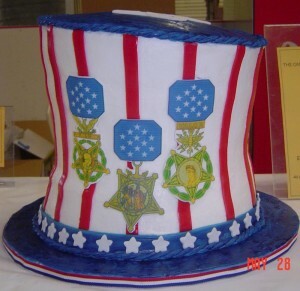 Smith, of Candie’s Cakes and Sugar Art in Liverpool, submitted a red, white and blue multi-layered top hat with military insignia on the front. The vanilla and red velvet flavor generated intense bidding in the final moments of the contest. Other cakes submitted included Jim Myers’ Open Book cake celebrating the theme of the weekend “Proud to be American”; Diane Sokolowski’s sheet cake portraying each of the arts in highly-skilled decorating technique; and Alissa Micelli’s two-tier red, white and blue drum and bugle cake complete with drum sticks. To learn more about the group visit www.CNYArtsCenter.com. Or contact Fox at 598-8812.